SEVERUS ALEXANDER. 222-235 AD. Æ Sestertius (32mm, 26.45 gm). Struck 232 AD. SEVERUS ALEXANDER. 222-235 AD. 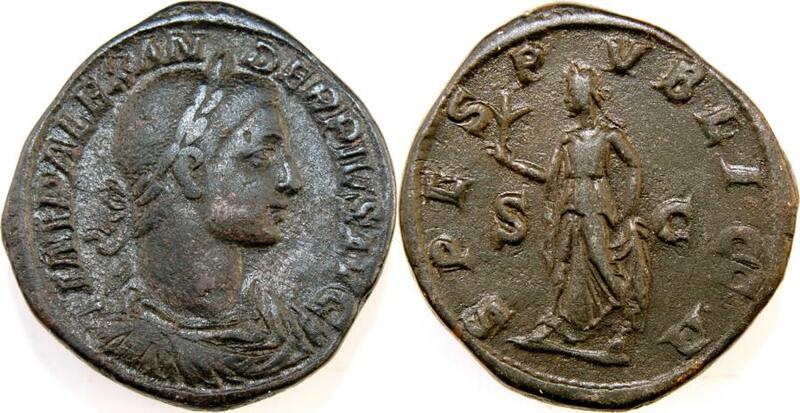 Æ Sestertius (32mm, 26.45 gm). Struck 232 AD. IMP ALEXANDER PIVS AVG, laureate bust right, drapery on far shoulder / SPES PVBLICA, S-C across field, Spes walking left, holding flower and skirt. RIC IV 648; BMCRE 902; Cohen 549. VF. SEVERUS ALEXANDER. 222-235 AD. Æ Sestertius (31mm, 20.92 gm). Struck 232 AD. Divus Antoninus Pius. Died AD 161. AR Denarius (17mm, 3.0 g). Commemorative issue. Antoninus Pius. AD 138-161. Æ Sestertius (33mm, 26.73). Rome mint. Otacila Severa Æ Sestertius AD 248 .